Kansas' Dedric Lawson drives the lane in the first half. Photo by Jason Schott. 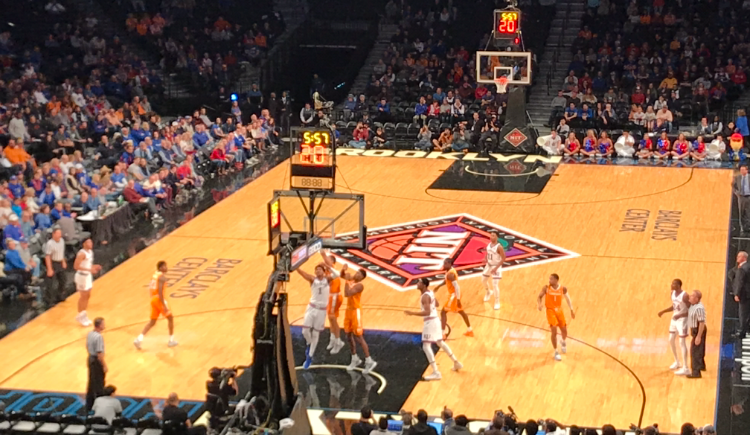 In the NIT Championship Game on Friday night at Barclays Center, Kansas, the second-ranked team in the country, outlasted fifth-ranked Tennessee, in overtime. The consolation game also went to overtime, and Marquette beat Louisville 77-74. Kansas improved to 5-0 on the season, and there were led by Dedric Lawson, who had 24 points on 9-16 from the field, 13 rebound, and 5 assists. Lawson had 26 points in Wednesday's semifinal win over Marquette to give him 50 points overall in the NIT. Devon Dotson had 17 points on 5-8 shooting, including one three-pointer, with 4 rebounds and 2 assists. Lagerald Vick had 15 points on 6-12 from the field, including 3-7 from behind the arc, with 4 assists and 2 rebounds. Tennessee, who fell to 4-1, was led by Admiral Schofield, who had 21 points (9-22 FG, 2-8 three-pointers), 6 rebounds, and 2 assists. Grant Williams had 18 points (6-13 FG, 1-2 on threes), 8 rebounds, and 6 assists. Kyle Alexander had 10 points and 7 rebounds, while Lamonte Turner had 10 points, 3 rebounds, and 3 assists off the bench. Kansas jumped out to a 19-14 lead in the opening minutes, but Tennessee battled back and a Jordan Bone three-pointer in the closing seconds of the first half gave them a 33-31 lead at halftime. In the second half, Tennessee opened up a nine-point lead, 45-36, on a Schofield layup at the 16:11 mark. Kansas battled back, and they took a 61-56 lead as Vick scored eight straight points (2 three-pointers and a jumper) with 6:05 left. Williams answered with eight straight points of his own to give Tennessee a 64-61 lead with 3:41 on the clock. The lead changed hands the rest of the way and the game went into overtime tied at 69. The overtime belonged to Kansas, as they jumped out to a 76-71 lead capped by K.J. Lawson free throws and a pair of free throws by Quentin Grimes with 10 seconds left made it 87-81 and sealed the game. Kansas scored 18 points in the extra frame, and Dedric Lawson (8 points) and Devon Dotson (7 points) did most of the damage. Sam Hauser (22 points) and Markus Howard (21 points) led the way for Marquette, who improved to 4-2 on the season. Hauser shot 7-13 overall, including 4-7 from behind the arc, while Howard shot 7-16 from the field, 2-6 on threes, with 5 assists and 3 rebounds. Marquette Head Coach Steve Wojciechowski said of Howard's performance, "I will say, I thought that this was one of the best four games Markus has had since he has been at Marquette. And you need to understand that there is a lot of pressure on Markus, especially with Greg Elliott being out and Joseph (Chartouny) being new. It's not like we have incredible guard depth so Markus has a lot of pressure on him to deliver and he delivered in a huge way tonight." Joey Hauser had 11 points, 5 rebounds, and 2 assists, while Theo John had 10 points (5-13 FG) and 6 rebounds. Louisville lost both games in Brooklyn and fell to 3-2 on the season. They were led by Christen Cunningham, who had 16 points (5-12 FG, 2-4 three-pointers), 3 assists, and 2 rebounds. Jordan Nwora had 15 points, 76 rebounds, and 2 assists off the bench.